EDtv (1999) – What's New on Netflix Canada Today! In a Hail Mary move for corporate preservation, the San Francisco based Northwest Broadcasting Corporation launches True TV, a new network which will broadcast the life of an Average Joe or Jane, 24/7 live and thus unedited, the subject chosen signed initially for one month. The project is conceived and led by one of the producers, Cynthia, but her boss, NWBC president Whitaker, will take the credit if it succeeds, and let her sink as the captain of the ship if it fails. The network is rebranded EdTV when Cynthia believes she’s found her subject, Ed Pekurny, a native Texas hayseed, who fits the two main criteria that she is looking for in the person: he is easy on the eyes, and he has what seems to be a potential trainwreck of a life in that he he is thirty-one years old, spends most of his time hanging out at the bar, and has no ambition beyond his longtime dead end job as a clerk in a video store. Ed did not actively campaign for the job – his blowhard of a brother Ray was the one who played to the cameras when Cynthia’s team was looking for subjects – but ultimately decided to do it after discussing it with those close to him, namely his immediately family of his mother, stepfather, and two siblings. After a slow start and despite some people associated with Ed hamming it up to the cameras in wanting their fifteen minutes of fame or more, Ed becomes enough of a toast to the TV watching public for the network to become a success. However, having the cameras rolling during certain times may not be the most advantageous for those directly involved, especially as someone from Ed’s distant past reenters his life, and an issue with regard to Ray’s relationship with his current girlfriend, a UPS delivery person named Shari who if Ed was being honest would admit that he is attracted to himself. 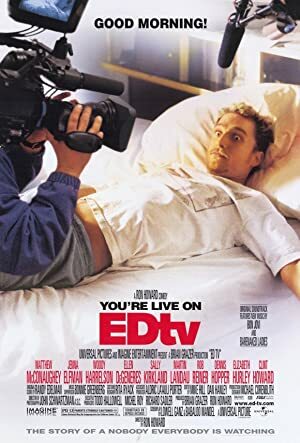 Other issues that eventually do emerge is Ed and those around him using the cameras as a convenient excuse for things that happen, and as Whitaker, against Cynthia’s wants as the moves being totally self-serving, begins to manipulate Ed to make EdTV more salacious TV viewing.